We take a look at the recent news and summarize some of the important developments and information regarding electric vehicles, aiming to provide you with a helpful update. Read here for Green4U’s September 2018 Electric Vehicle (EV) Industry Insight #4. CEO of Total S.A., the 4th largest multinational oil and gas refining company, Patrick Pouyanne recently admitted to owning an all-electric car. All-electric as in zero gas consumption, as in no oil and gas, as in … you get it. Pouyanne was quoted as saying, “It’s a 100 percent e-car … And I’m driving it every weekend.” Currently, Total’s wind, solar, and renewable assets account for five percent of its business, however, the goal is to drive that to 20 percent by 2035. Formula E is set to adopt a new ‘Extreme E’ series that will feature electric SUVs. The series will test the rugged vehicles through challenging locations and terrains, such as the Himalayas and the Arctic. The project is expected to launch in 2020, has been presented to vehicle manufacturers as a potential spec-series in which the chassis specification will be set and the cars will be designed after road SUV models. “SUV is the name of the game – that’s where the big manufacturers are going and that’s where I think this will be.” Formula E CEO Alejandro Agag had to say in regards to the significance for manufacturers to offer SUV in electrified models. Formula E charges forward with a further support series. According to Bloomberg’s Electric Vehicle Outlook 2018, sale of plug-in electric cars is forecasted to reach 11 million units annually by 2025 and 30 million by 2030. By 2040, plug-in cars are expected to represent 559 million units, making 1 in 3 vehicles on the road an electric vehicle. In 2010, battery packs were estimated to cost about $1,000 per kWh, while in 2017 the average cost was just $209 per kWh. By 2030 Bloomberg sees $70 per kWh possible. Due to the continued decrease in the cost of batteries, the forecast shows that between BEV and ICE, cars should be comparable in cost across the board starting in 2024 and it is expected that they will be competitive in virtually all market segments by 2029. 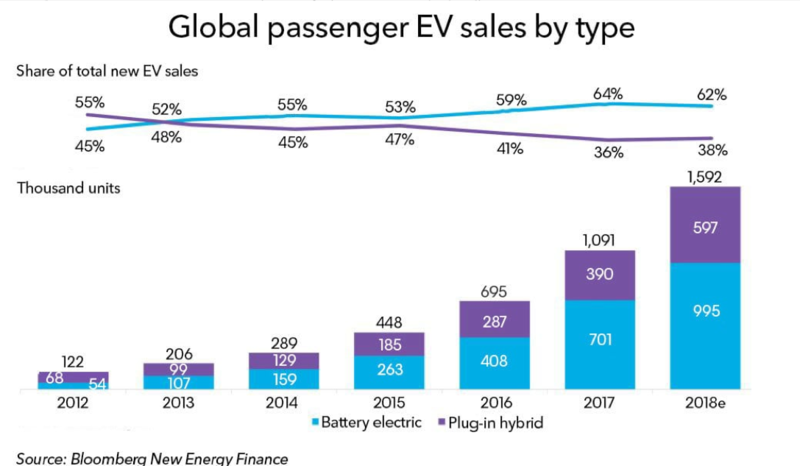 EV industry sales continue to charge forward. First Ultra-Fast Chargers Installed in U.S.
Electrify America (a program formed due to Volkswagen’s Dieselgate scandal) has opened their first ultra-fast charging station in the U.S. There are now 10 stations open spanning nine states of the planned 2,000 chargers to be installed at 484 predetermined locations. You can charge forward even quicker thanks to Electrify America!